Government map depicts railway lands, lands "disposed of", grazing leases, and timber berths. Shows the British Columbia 'railway belt' running from Greater Vancouver to Field, B.C. Map depicts railways in British Columbia, with insets for the Lower Mainland and the Kootenays. Map depicts Canadian railways in operation at 2011. "Canadian National Railway System: The Only Railway Serving All Ten Provinces of Canada"
Map depicts the CNR system in Canada and the United States and all of its connecting lines, including the Central Vermont Railway, the Grand Trunk Western Railroad, and the Duluth Winnipeg & Pacific Railway. "Canadian Pacific Railway and Connecting Lines - Ticketing Routes"
Map depicts passenger routes on the Canadian Pacific Railway and its connecting lines in 1925. "City of Vancouver, British Columbia"
Map depicts the city of Vancouver and its railways. 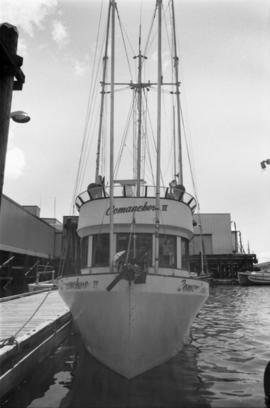 Photograph depicts the "Comanchero II" boat in the Prince Rupert Marina. Another building and boat are visible in the background. Technical drawing depicts a condensed profile of the CN Albreda subdivision. "Coquitlam, Port Coquitlam, Port Moody"
Real estate map depicts the areas around Coquitlam, Port Coquitlam, and Port Moody, including rail trackage. Map depicts the Cowichan Lake area, including rail trackage for the Western Forest Industries Logging Railway, the Canadian National Railway, and the BC Forest Products Logging Railway. Architectural plan depicts a proposed standard 10 stall engine house with annex for machine shop and boiler room to be erected at Kamloops, BC. 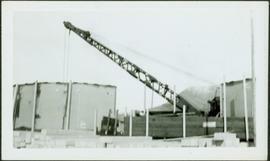 "Granville Island Industrial Sites, False Creek, Vancouver, B.C. : Plan showing sewers, water pipes, tracks, roads, etc. as constructed"
Plan depicts Granville Island industrial sites in False Creek, Vancouver. Shows revised trackage from 1955 annotated in colour by Davies. "Historic Railways of the Lower Mainland of British Columbia"
Plan depicts the location of buildings occupied by the Northern Construction Company on the old Kamloops Station ground. Map depicts the city of Kelowna and area. Annotated by Davies to emphasize rail lines. Map depicts area around Kelowna, with annotated Kettle Valley Railway Carmi subdivision line, Hydraulic Lake, and McCulloch. "Kettle Valley Railway Condensed Chart, Brookmere to Odlum"
Technical drawing of Kettle Valley Railway depicts trackage and a gradient profile for the line. "Location Map of Mining Properties in British Columbia and the Yukon Territory (including part of Northwest Territories)"
Map depicts locations of all mining properties in British Columbia. Includes index with names of owners of properties. Plan depicts the location of the Lyon Creek Bridge and borrow pit on the CNR Clearwater subdivision. "Map of Lower Mainland Railways"
Map depicts rail lines in the BC lower mainland, including BC Hydro Railway, Burlington Northern Railway, the Canadian Pacific Railway, the Canadian National Railway, and the Pacific Great Eastern Railway. "Map of the Pacific Great Eastern Railway"
Map depicts the routes of the Pacific Great Eastern Railway, showing stations, railway connection, and the PGE Microwave Communication System. Plan depicts architectural drawings of the Canadian National Railway station in Kamloops. Includes an elevation of the building and floor plans. 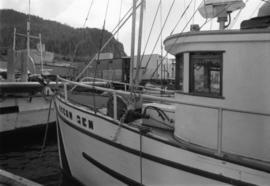 "Ocean Gem Boat at Prince Rupert Marina"
Photograph depicts the "Ocean Gem" fishing boat at the Prince Rupert marina. The Prince Rupert Fisherman's Co-operative Assocation Building is visible in the background. "Pieces of Eight Treasure Map, British Columbia, Canada"
Map depicts the Shuswap Lakes, Rogers Pass, Kamloops, Yellowhead Pass, Thompson Valley, and the Nicola Valley. Also includes the first clues to a treasure hunt. "Plan Showing Proposed Location of Station, Crossing of Cawston Ave and Street to be Closed, Yard Layout and Connections with C.P.R., Kelowna, B.C." Plan depicts a proposed location for a CNR station and crossing in Kelowna. Plan depicts the proposed location and layout for the Canadian Northern Pacific terminal at Kamloops on the Kamloops-Lumby branch. "Plan Showing the Growth of Vancouver's Street Car System as from the Laying of the First Tracks in 1889 to the Last Section Laid (Clark Dr., Hastings to Venables)"
Map depicts the growth of Vancouver's street car system as from the laying of the first tracks in 1889 to the last section laid (Clark Dr., Hastings to Venables). Plan depicts the CNR rail yard in Kamloops. The plan was originally drafted on March 6, 1928 and updated to July 1937. Plan depicts the Canadian Pacific Railway yards in Kamloops and the proposed connection between CPR and CNR. Includes a CPR track profile, profiles of street crossing, and enlargements. 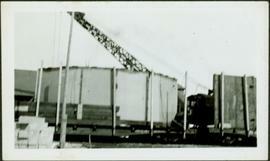 "Plan shewing proposed yard layout at Kelowna, B.C." Plan depicts the proposed CNR rail yard layout in Kelowna. A later plan, dated May 30th 1925, shows drastically reduced trackage and no barge slip. "Proposed Fill of Trestle Bridge, Lyon Creek"
Plan depicts a section, profile, and contour plan of the fill of the Lyon Creek Trestle bridge in the Clearwater CNR subdivision. "Railroad Map of Greater Vancouver"
Map depicts rail trackage in the Greater Vancouver area, showing dates of completion and abandonment of railway lines. Also shows proposed rail lines. Map depicts railway lines in the state of Washington, including those crossing over the border into British Columbia. "Railroad Map of Western Canada and Alaska"
Map depicts all current rail lines in Western Canada and Alaska and major railway stations. 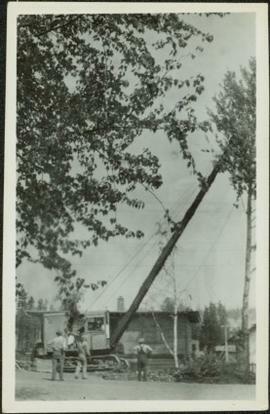 Includes insets for Alaska & Yukon, Edmonton area, Winnipeg area, and the Vancouver area. "Railways of B.C. Past and Present, Historical Reference: Draft #1"
Hand drawn draft map depicts historical railway routes in British Columbia. Includes dates and annotated information about rail lines. Map depicts south eastern British Columbia, with highlighted annotations by Davies to emphasize location of rail lines. "Squamish, New Westminster District, British Columbia"
Map depicts the City of Squamish, Howe Sound, and the Britannia Mine. Map depicts the cities of Summerland, Penticton, and Naramata. Annotated by Davies to emphasize the rail lines in the area. "The British Columbia Centennial Treasure: Official Map"
Map depicts location of treasure hidden between Clearwater and Clemina, BC.